How fast can you tap through your times tables? 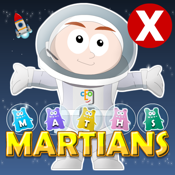 Maths Martians is one of the most addictive times table teaching & learning iPhone apps available, helping children to learn, practise and master multiplication while having lots of fun. With 12 beautifully-illustrated & animated levels (1x to 12x) this is an app that can test, entertain and teach the whole family. It’s a great way to boost mental calculation skills too. We’ve turned learning the times tables into a fun Martian bubble-popping game. Plus, it’s all against the clock. Tap through each times table correctly and you’ll get enough energy from the cheeky Martians to help Spaceman Sam fly his rocket back to earth. If you fail to do it in time, he’ll be stuck on the red planet until you succeed. So, let our Maths Martians app give your child a head-start on their road to Maths success. Play with your child or play against them, however you play you’ll combine learning with fun. When it comes to taking the first fun steps towards successful numeracy/multiplication, we think it’s a hard app to beat. It’s not just for kids! Test your children, learn with them, and most of all have fun, as you see how fast you can tap through your times tables. Beat your own time, beat your friends’, and your family’s. Once you play, you’ll not want to stop. Developed by online & mobile education specialists, Cambridge English Online Ltd, with 10 years’ experience creating cutting-edge online and mobile resources, Maths Martians has been tested and reviewed by teaching professionals and parents and aims to support National Curriculum guidelines on teaching and learning numeracy time tables/multiplication. ***The iPad versions of the Maths Martians series are already getting great reviews on: Kids iPhone App Review, The iPhone Mom & the iPad Fan. Check out our Developer page for more information on these ‘big-screen’ apps. - 12 correct answers and 2 distractors for each level. - Kids learn their times tables/maths while playing.